I have to admit I was a little nervous at the thought of sea kayaking, especially in water that was only 1 – 2 degrees, but the sun was shining and the wind was down so we were promised a good day on the water. 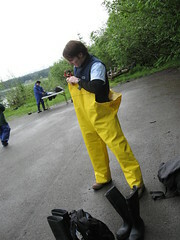 When we reached Douglas Island, about a 15min drive from the capital, we jumped off our old school bus and straight into our wet gear – big rubber pants, gumboots and our life jackets. As you can see the ensemble was quite stylish. Simon sat in the back so he could steer and I sat in front so I could set the pace and get a good view. The fjord where we were kayaking was at the foot of the Mendall Hall Glacier and whilst we were still about 10 mile from the glacier the veiws were fantastic. Along the way we saw a number of eagles and in the distance (which I was glad of) was a whale. The highlight though was a seal that kept following the kayaks and popping his head up to have a look. I maintain that I did most of the rowing but even still the trip was very peaceful and the water was like a sheet of glass. The guide said that it was the best weather that they had had in a long time. After the kayaking the bus dropped us back into town which gave us a chance to post a few letters and buy some home made fudge -peanut butter of course. Simon has also started collecting fridge magnets so we went hunting for a good Juneau magnet. Overall, we weren't impressed bythe city of Juneau, apart from the governmet buildings the rest of the town was tourist shops. The sea kayaking however was well worth the trip and I am looking forward to doing a bit more of it on our other trips in Canada. 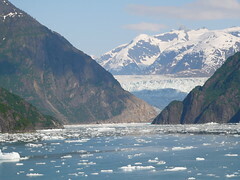 Port one on our cruise – Ketchikan the salmon capital of the world! There is so much salmon here I’m going pink just thinking of it – tinned, canned, boxed, dried you name it and you can find it here – I’m bringing you all home some salmon jerky, sounds appetising doesn’t it! Ketchikan is one of the oldest fishing villages in these parts and as I look out of the cafe window the only thing that reminds me that it is 2006 is the mobile phone tower in the background. The town itself is what you would expect of a fishing village, it is colourful and messy and has a cheeriness that only a shoreline of timber shacks can produce. Rather than take a bus tour with the other ship dwellers we decided to grab a walking map from the info centre and explore ourselves which turned out to be a good idea. 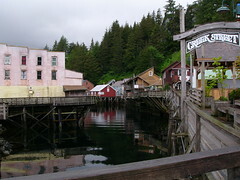 We saw the back streets of Ketchikan, where there were no tourists, as well as the tourist hot spots like Creek Street (Ketchikan’s former red light district). Author SimmoPosted on June 5, 2006 Categories Alaska1 Comment on Appologies on our lack of updates. The Best Man, Daniel, has planned a bucks 'day' for me tommorow. An entire day sounds a bit extreme but I'm not really fearful and think we will actually have a great day but am a little concerned what my other friends (Pete and Degrassi) have in mind for me. I'm fairly confident I will end up wearing a dress at some stage of the night. I can live with that. As long as they don't end up getting me arrested somehow. The plans are to play bowls at Mortdale for a few hours in the afternoon then head in to the city for dinner and a few drinks at the James Squire hotel. I've never been there before but James Squire is my favourite beer so it must be good. Gemma is going to be out with her mum, sister and some other girlfriends for a similar themed day in Darling harbour. I don't think she has much to worry about though. 1 week to go till our wedding, 2 weeks till our departure… lots of loose ends to attend to.